This entry was posted on July 1, 2009 at 8:48 PM and is filed under Desserts, Recipes. You can follow any responses to this entry through the RSS 2.0 feed. You can leave a response, or trackback from your own site. I love tiramisu and this sounds like a great recipe. Thanks! Thanks Melissa for dropping by. This is really easy to make and better than many restaurants serve. Enjoy! 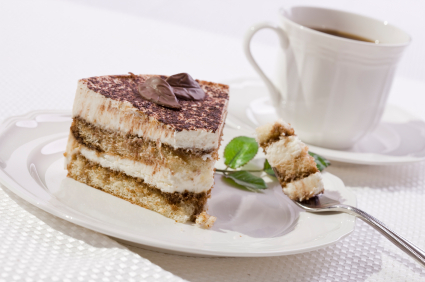 I absolutely looooove tiramisu and have been searching for a good recipe for a long time now. Will be sure to give yours a try, looks beautiful! You’ll enjoy this one…be sure not to get the savoiardi too wet otherwise they will be soggy. I have been wanting to make this, but could not find the mascarpone cheese at the supposedly good grocery down here Publix. I just found it the other day at Winn Dixie of all places, I will be trying this soon. Thanks for the recipe! You can always use cream cheese. Its nearly the same consistency and flavor. I made this in the South Pacific substituting sponge cake for savoiardi biscuits, rum for marsala and cream cheese for mascarpone. It was always a hit even tho it wasn’t authentic. Enjoy!